Our little daughter is in the final half of her PreKindergarten year with the same teacher that taught my son... almost 5 years ago! Dropping her off at school, I walk her in... and starting a conversation with one of the moms, I admire her shirt! You may know that I love fashion and often my crafts are inspired by clothes, shoes, accessories and more! Here is a card inspired by the lovely shirt this mom had on - she laughed when I told her I liked her shirt and that it'd inspire a card... now, to give this to her... lol. 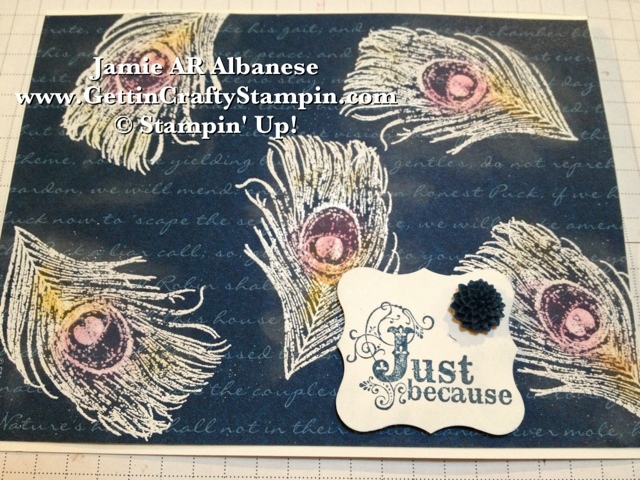 Utilizing the new Fine Feathers stamp set (Idea book), Vintage Verses stamp set (Sale~A~Bration mini) and the Print Poetry Designer Series Paper Stack (Spring mini), Whisper White card stock, White embossing powder and Midnight Muse ink, the Curly Label punch and our Chalks to add the texture and color of actual chalk and a dash of color! 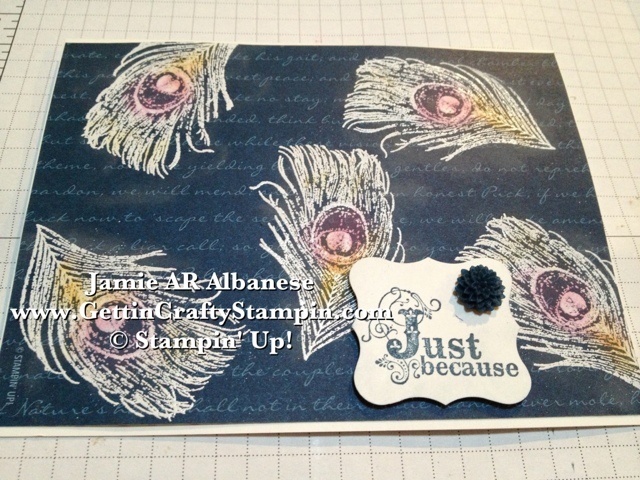 Prints Poetry DSP is perfect for this card! The stunning In Color Dahlia's (Idea Book, Embellishments) is color coordinated so it creates ease when making a color palate for a card! 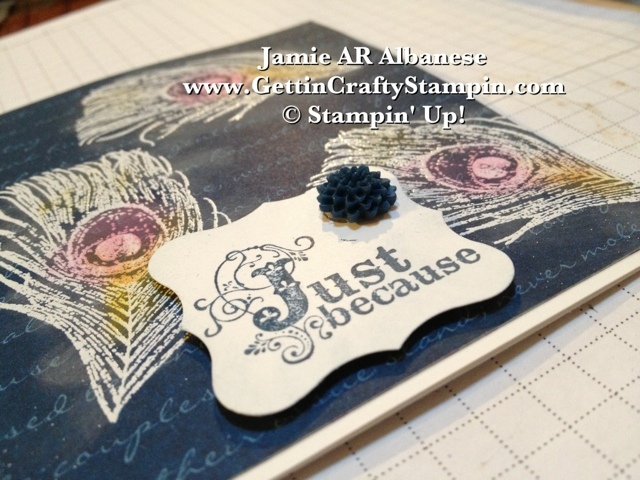 Subtle coloring from the chalks, the raised punched sentiment in the matching ink and the Pop of a matching flower.... I really love the look of this card - the subtle text on the paper is just such a fun surprise! Don't you just Fall for feathers?? I Love them, I've even made a wreath from Peacock Feathers! Here is a cool, easy and fun way to celebrate the natural feather with the trendy look of a Chalk Board! 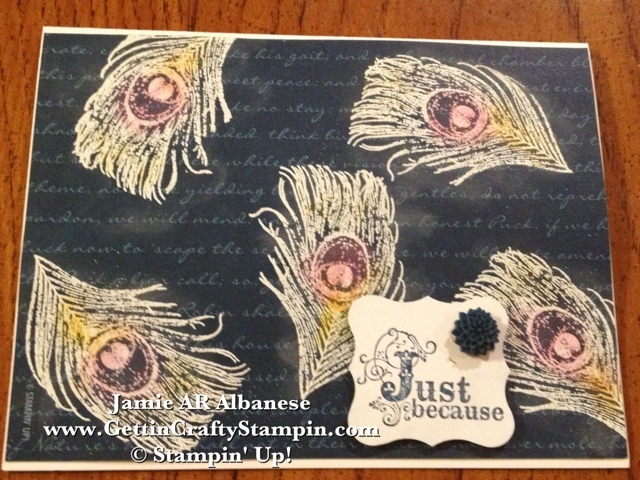 Do you hoard papers and embellishments?? Pull them out and USE them - order more! Our papers and accessories are low cost but have a Big Bang for the Buck! 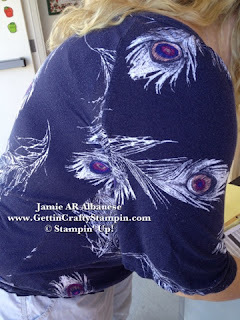 Pick up YOUR Prints Poetry Designer Series Paper, coordinating embellishments (those Dahlias are great for the pack as the In Colors are used and easily coordinated)! Join in on the FUN, it's Endless! Sale~A~Bration mini are available for a limited time! Cool card! 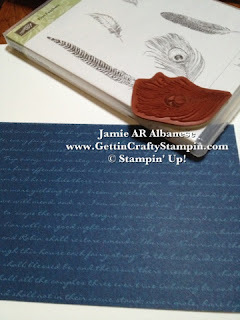 Besides letting non-stamping items be an inspiration for cards, I also think in Stampin' Up colors. Thanks for sharing this card as part of the LNS Challenge. Both your shirt and the card are DEFINITELY stunning! Thank you so much for playing with the LNS Challenge!